Charlottesville’s reputation as a “World Class City” is long gone and unlikely to return. Now internationally recognized as the “Capital of the Resistance” and a home for violent anarchists, Charlottesville is considered, by many, a fallen city. It’s been one year since the violent white supremacist rally in Charlottesville. One year since Nazis with torches felt bold enough to openly march in the streets of our city. One year since peaceful protestor Heather Heyer was killed when a car accelerated into one of the Charlottesville crowds. And one year later, the disgraceful Confederate statues that prompted the protests still stand. We haven’t forgotten. 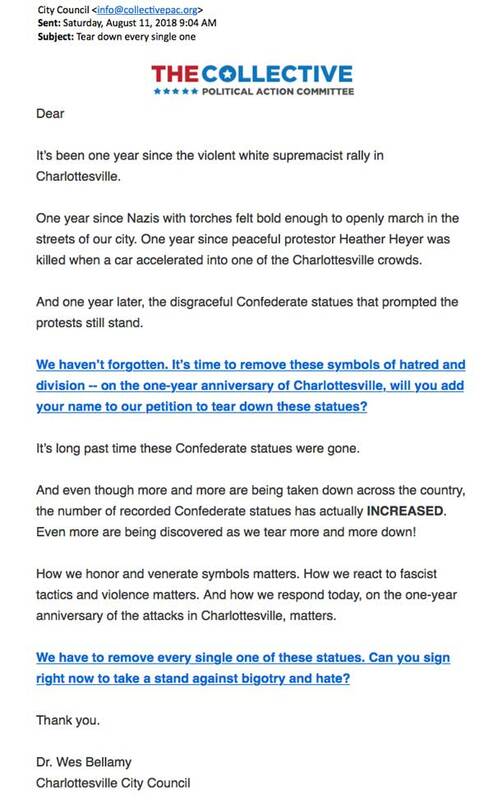 It’s time to remove these symbols of hatred and division — on the one-year anniversary of Charlottesville, will you add your name to our petition to tear down these statues? It’s long past time these Confederate statues were gone. And even though more and more are being taken down across the country, the number of recorded Confederate statues has actually INCREASED. Even more are being discovered as we tear more and more down! How we honor and venerate symbols matters. How we react to fascist tactics and violence matters. And how we respond today, on the one-year anniversary of the attacks in Charlottesville, matters. We have to remove every single one of these statues. Can you sign right now to take a stand against bigotry and hate? This, unfortunately, was not the first time Councilor Bellamy directly interfered with police officers in their efforts to enforce the law. The speaker’s remarks were received by some Councilors with tacitly sympathetic chuckles and joking. No councilor expressed concern over the explicit lawlessness of the threat itself. While Charlottesville’s government continues to spin wildly off-center, raucous public meetings and accompanying calls for social, economic, and legal anarchy come at great cost. Most recently, local developer and perennial City Council ally, Keith O. Woodard, cancelled the long-planned $50 million West 2nd project, citing an “adversarial” relationship with the City and “uncertain” process. The development was expected to net Charlottesville nearly $1 million annually in direct tax revenue. Adding insult to injury, Charlottesville City Councilor, Mike Signer, himself was General Counsel on the Project Team for WillowTree at Woolen Mills. In such capacity he presumably helped negotiate app developer WillowTree’s exodus from Charlottesville into neighboring Albemarle County—a $20 million, 200-job boon for Albemarle’s economy and another crushing financial blow to the City, this time delivered by a Charlottesville elected official. 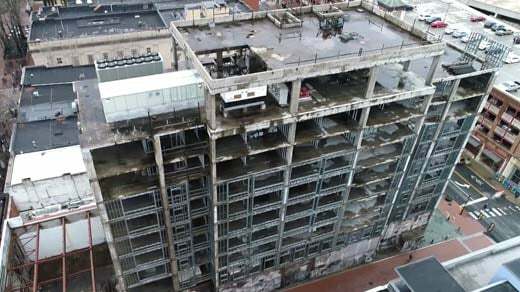 Nine years on, the rusting hulk of the Landmark Hotel on Charlottesville’s downtown mall stands as a monument to ineffective, bumbling, incompetent governance. The economic implications are manifest; no rational developer would risk large-scale “investing” here presently. But the escalating social and civic anarchy promulgated by the current crop of councilors has impelled Charlottesville into a rapid downward spiral, wherein nothing much may be left to “tear down” when all is said and done.